I’m delighted to welcome Stella Hervey Birrell to my blog today. This is a wonderful post- so I suggest getting comfortable for a few minutes- preferably with cake to hand. Finding True Love: Ten Years on. This September will be ten years since the day I ‘pulled myself together for my lines,’ as someone drily commented on my wedding day. Tears had fallen while Mr HB pledged himself to me for life, but no way was I missing out on my turn to speak! It will be ten years since my husband set his face to ‘sure’ as I completely blanked him on my way down the aisle (I wrote about this on the My Reading Corner Blog here). Ten years since my husband’s daughter floated around looking like a fairy, and my husband’s son looked a bit grumpy, but it was partly because his shoes were too tight. Ten years since I put on a golden band. 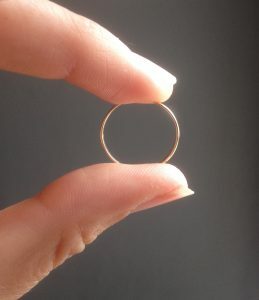 My golden band – it still fits! Well, actually … a couple of things have happened recently. I realise it’s only now, nearly ten years later, that I am even close to moving away from that ‘smitten-early-days’ fog. Like when I noticed that my husband is really stubborn – about nine months ago. I always wondered where the kids got it from. I don’t think that it is a coincidence that he works away sometimes. If anyone was daft enough to ask me for advice on maintaining a healthy relationship, it would be this: make sure one or both of you has a job where you have to travel. Not a lot, but a little. 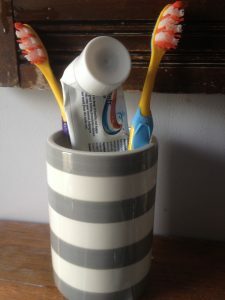 Each meeting becomes a rekindling, a jolt of recognition … and someone else to brush the kid’s teeth, if he hasn’t timed his arrival to just after bedtime. We’re older. Crikey, that’s an obvious thing to say. I suppose, what is perhaps slightly more interesting, is that I am now about the age he was, when we met. For the mathematically challenged amongst you, that means he’s older than me, by quite a bit, as I’m fond of reminding him. I’ve become healthier, and he hasn’t. But he really, really won’t want me to talk about that. We have a mutual support thing that mostly works – until I decide I want a ‘day,’ and he’s already having a ‘day,’ and I go straight into full-on huffy ‘I never get to have a day when I’m the ill one’ mode. See, maturity has nothing to do with age. He has four children now, and I have two biological – washing powder kids I call them – and two that went to our wedding. I’ve got a new job – two, I suppose, I’m the main mean mommy when he’s four on. But when he’s on four off, my job is tippity tapping away, making stuff up and then writing it down. 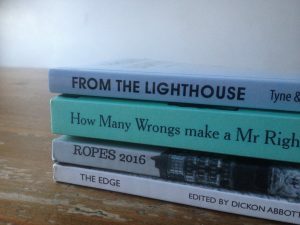 A selection: my printed work. Our commitment has endured, in a way I never imagined I would experience. Ten years is a long time, and becoming a ‘writer’ is a big deal. It takes a lot out of family time, and I do not take it lightly that he is only too happy to make up the shortfall. After a lifetime of Mr Wrongs, Mr Right, who became Mr HB (his preference, and based on my pen-name) is still my chosen person. He’s still my best bet when I need to pull myself together, and pull out some lines. 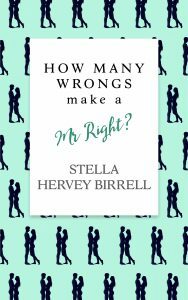 My debut novel, How Many Wrongs make a Mr Right? Stella Hervey Birrell blogs at #atinylife140 tweets at @atinylife140 and can be found on Facebook here.